If you access Facebook frequently from public wi-fi hotspots, or even your college network, you will be surprised to know that it’s extremely easy for others to snoop on your Facebook data. To avoid this, you should turn on the secure HTTPS option of Facebook right now. Go to Account –> Account Settings –> Account Security, and enable the Secure Browsing (https) option. Want a quick chat with a friend, without getting sucked into all the distractions of the Facebook site? 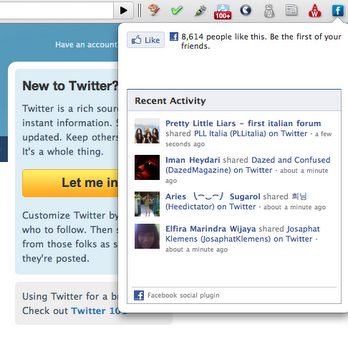 Head over to imo.im, log in with your Facebook account, and you will have your chat going in no time. According to many Facebook users, the new lightbox-style photo viewer is ugly and distracting. If you couldn’t agree more, just download this tiny userscript to revert back to the plain old photo viewer. Facebook recently decreased the font size across the entire site, making us all want to poke our eyes out while trying to read the text. To get back to the old font size, you can simply hit the Ctrl + + (Cmd + + on OS X) key combination on any web browser. Do note that this may break the site design, especially if you have enabled the “Zoom Text Only” option. For increasing font size without breaking anything, try the F.B. Purity extension mentioned below. The really horrible thing about Facebook Groups is that any friend can add you to any group, without your confirmation. If you have been added to a spammy group, click on the See All link on the left sidebar of your Home page, scroll down to the My Groups list, hover over the group you want to remove, and click on the cross icon that appears. Once removed, no one can automatically add you to that particular group again (although you can manually request to be added later). If you have many active friends on Facebook, your newsfeed is likely a hodgepodge of links, status messages, photo albums, game requests, spammy apps, likes, group discussions, and other stuff. With the F.B. Purity browser extension, you will have fine grained control over what to show and what not to show on your Facebook newsfeed and profile. F.B. Purity also gets rid of the hideous Facebook ads to further clean up the site. The recently overhauled Facebook Messages can serve as a sufficiently good email service for people who have to deal with only a few emails everyday, and are overwhelmed by Gmail or Hotmail. If you haven’t got the new Messages in your Facebook yet, head over to this page, and request for an invitation at the bottom of the page. Once approved, you can get your own @facebook.com ID and use it like any other email service. If you’re an active YouTube viewer, and would like your favourite videos to appear on Facebook automatically, here’s a little setting for you. Go to your Activity Sharing page on YouTube, connect your Facebook account with the link provided, and choose the actions that you’d like to share (“favourite a video” in our case). Remembering everyone’s birthday is a near-impossible feat, but you can always make use of apps to make your life easier. Facebook allows you to export the birthdays of your friends in an always up-to-date webcal format that you can add to Google Calendar and set reminders. To grab this webcal URL, go to the Friends’ Birthdays page, scroll to the bottom of the page, and click on the Export Birthdays link. Grab the webcal URL, and add it to Google Calendar (or any other calendar service that you use). There are many ways to get Facebook notifications on your desktop. Mac OS X users can download the official Facebook Notifier app, that does what its name says. Windows 7 users can download Internet Explorer 9, open facebook.com in a tab, and pin the tab to the taskbar to get notifications. Ubuntu users can add their Facebook account to the built-in Gwibber app to receive desktop notifications. Scams and rogue apps are a bit too common on Facebook, so a security app is always good to have. Just add BitDefender SafeGo to your account, and it’ll scan your account for bad links and apps. It also lets you know if you’re publicly sharing stuff that you shouldn’t. The web is filled with Facebook Like and Connect buttons these days, and you’re tracked almost everywhere you go mostly for targeted ads). Cross-browser compatible Ghostery protects your privacy by blocking over 250 known tracking and sharing networks from webpages, Facebook being one of them. Unlike some similar services, Ghostery doesn’t break stuff by over-aggressively blocking anything and everything it finds. Facebook has a perfectly functional mobile site for the smaller screen devices, but did you know that it also provides native apps for the popular smartphone platforms too?! Facebook has apps for iOS, Android, Windows Phone 7, and Blackberry. These apps are usually much faster than the mobile site, and also provide better integration and more features. The Facebook app is probably already there on your smartphone, but do look in your respective app store in case it isn’t. Facebook doesn’t have to be all play and no work! Docs.com is a fairly good office suite, whose strongest selling point is that it hooks into your Facebook account to provide powerful collaborative features for your projects and documents. Facebook Chat has a lot of limitations, the inability to video chat being one of them. If you’re longing for a video chat session with one of your Facebook pals, all you have to is install Skype, connect your Facebook account to it, wait for your friends to do the same, and get chatting! This works only the Windows and OS X clients of Skype for the moment, with Linux support supposedly coming in future. This is also possible with the TinyChat webapp, although nothing beats Skype in clarity of voice and quality of video calls. Facebook Like buttons are everywhere, but what if you do stumble upon an interesting page that has absolutely no sharing buttons? The Facebook Likes Chrome extension lets you like any website you’re on, with two quick mouse clicks. If you have created a Facebook page for your site or product, you can actually use Facebook as that page. It sounds really weird, which it kind of is, but it’s still possible for some reason. To do this, go to the Facebook page for your site / product, and click on the Use Facebook as [Page Name] link on the right sidebar. Ping.fm is a useful service that allows to simultaneously update your status across a gazillion social sites. With their Facebook app, you can easily push your Facebook status updates to any other social network that you wish. Add it here. It’s highly unlikely that you’ll wake up one day and find all your Facebook data missing, but hey nothing is impossible, right?! With Backupify’s free plan, you can rest assured that all your Facebook photos, links, status updates, contacts, events, videos and other stuff are being backed up weekly, and can be retrieved any time you feel like it. The free plan does have a 2GB storage limit, but that should usually be more than enough for your Facebook stuff. Facebook get those opinions and deliver them back to you! 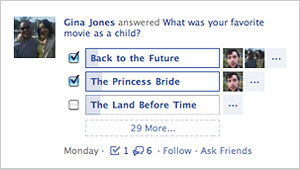 With Facebook Questions, you can quickly create polls and send those to all or some of your friends and wait for them to answer back. Questions is actually effective, unlike similar other services, as neither you nor your friends have to do much (and no one likes working more!). You can turn on Facebook Questions from this page, after which you’ll find it next to the other status updating options. So that’s it – 20 Facebook tips that can be really useful for you! Hopefully you enjoyed reading it! And if you have own nifty Facebook tips, do share them in the comments as we are always itching to learn more. 0 Respones to "Coolest facebook tricks ever"